The sky was grey as Mum drove along the narrow road to Candlewish Witches College. The car was filled with an awkward silence, made all the louder by the noise of the autumn wind outside. We'd bickered and argued for most of the journey. Mum had kept going on and on about university admission date cut-offs, telling me I should get started on my applications, while I told her I still wasn't sure and that I'd get to it later. "Amelia," Mum had said. "This is a big decision. I hope you're thinking about it carefully." After that, I'd popped my headphones and ended the conversation. Ravens circled the famous stone towers of the college that loomed above. Nestled at the top of Zanzar's Peak, Candlewish was one of the oldest colleges at Tyrthumbria University. As a school of magic in an otherwise regular university, Candlewish was popular with tourists, even on a dreary day like this. A few people snapped selfies with the towers in the background. It was hard to believe that magic had once been so important. Now it was regarded as an archaic and peculiar field of study, out of place in a world ruled by science and technology. The brakes squealed as the car came to a stop in front of the stairs that led to the entrance where a few women were huddled in great black coats. "Well," said Mum. "Let's go say hello." We stepped into the cold, and a sprightly woman walked briskly forwards. "Megan Montague?" she asked in a commanding voice. "Yes, hello. You must be Headmistress Sparrowfall?" "Yes, we spoke on the telephone. Thank you for coming." The headmistress glanced over her shoulder. Two women were speaking in calm voices but an older woman with flowing silver hair argued and snapped at them. "I'm quite capable, young lady!" growled the silver-haired one. "I'm one of the most respected witches in the land!" "Come now Mavis, let me take your broom." "I'll not have some presumptuous apprentice touching my things!" she answered, snatching a gnarled old broomstick. A gang of ravens had come to observe and were cawing loudly. "Sixty-two years teaching at this institution," she cried. "Sixty-two years! And to say thanks I'm packaged up and shipped off to live out my final days in the suburbs. The audacity!" She slammed her broomstick into the ground and a cracking sound ripped the air as a flash of light shot from the wooden tip. It sparkled then fizzled, pale yellow strands of light reaching out and smacking Headmistress Sparrowfall's hat. It spun and fell to the ground, rolling to my feet, a thin wisp of smoke swept away by the wind. "Mavis!" shouted one of the ladies. Tentatively, I grabbed the hat, worried I might get zapped in the process. I handed it to Headmistress Sparrowfall who simply smiled at me and placed it upon her head. I looked at Mum, my eyes wide. What the hell? I wanted to say. You told me she was a kind little old thing! "I'm supposed to get in that?" Mavis said incredulously, looking at our car. "It looks older than me!" "She's worked up," said Headmistress Sparrowfall. "A cup of tea and some quiet is all she needs." I wasn't sure, but Mum walked over to the women. "Hello Aunt Mavis, how are you?" Mavis looked at Mum side-on, one eye squinting. "Nancy, have you had something to do with this?" "It's Megan. I'm your niece, Nancy's daughter." Mavis blinked and wiped at her eyes, a flash of moisture reflecting on her cheek. She didn't seem the type that would cry, and it might have just been the wind. She turned and scowled at the other witches then gave a massive sigh and moved down the stairs to the car. "Goodness me!" she said, looking me up and down. "Have you even brushed your hair today?" Before I could answer, she handed me her broom and got in. "Well, let's get on with it then," she barked. "I don't want to stay where I'm not wanted!" The other witches had opened the boot and were placing her bags inside. I managed to position her broom so that it went through the middle between the two front seats. It meant I'd be sitting next to the dusty old straw. "It will be lovely to have you," said Mum. "We've set up Amelia's room for you. You'll be quite comfortable." Mavis didn't say anything. As we drove down the road, I saw her eyes reflected in the rear vision mirror, a steely expression on her face as she watched the towers slip away. "Is it even safe for her to be here?" I asked Mum as we washed the dishes after dinner. "I'm a little worried that she'll, you know, kill us." Mavis had gone to her room – my room – for I had been relegated to the spare bedroom, which didn't even have a window and was barely more than a closet. "Yes, yes," said Mum. "The college assured me." "Does this happen to all witches?" "Yes, although they're not sure why. Something to do with the magic, maybe a side effect of all those spells over the years. Frazzles their brains." "Didn't you say she turned one student into a frog and then forgot where she put it?" "Well, yes, but they found the frog and turned it back to human." "And wasn't there something in the news the other day? Unleashing an imp that ran wild in the library? The article said old witches are a menace!" "That was in OK Now. You know how those magazines sensationalise everything. Magic's mostly showmanship. Lights and colours and not much substance." "Well, let's just hope she doesn't electrocute us like she did to that headmistress!" "Oh Amelia, she'll be fine. She's a very accomplished woman. Did you know she has a Ph.D.? And she spent a year living in Samoa. I'm sure she'd love to talk to you about going off to university. Speaking of which—"
I loudly placed some plates into the cupboard. "—There's an open day this weekend, we could look around campus, meet some students who—"
"Mum!" I yelled, slamming the cupboard door shut. She turned to the soap suds and we finished up without saying anything else. The flat was quiet except for the dull noise of Dad watching his game show. He'd be going to bed soon as his shift started at four in the morning. Mum would read one of her mystery books before she went to bed too. Time for me to study. I realised I'd left my chemistry book in my room, and I'd have to go get it. I stood at the door, and a vague memory came. The last time Mavis had visited us was with her sister, Nancy, my grandmother. They'd come for a birthday of mine. I must have been seven or eight. I remember Mavis as cheeky and a lot of fun. She'd made the candles on the cake go on and off when I blew them out and I had laughed and laughed. I couldn't imagine her being silly now. I knocked on the door. After a few moments, I heard a small voice. "Hi, Aunt Mavis. It's me, Amelia. I left a book of mine in there. Can I come get it?" "Come on, then," she said, and I stepped inside. She sat in a chair by the open window, a cool wind spilling inside. She was rubbing a minty smelling ointment into her hands. I went to my desk and found my book under a stack of papers. Beside it lay a set of leather wrapped notebooks. Each one had a scruffy thread twined around it, the pages inside thick and brown with age. I ran my fingers along the first one, feeling a tickle in my skin, and I drew in my breath. A fluttering sound came from the window and a sudden cawing, which made me jump. Mavis reached a hand up, touching the beak of a large raven that sat on the windowsill. She was cooing to it quietly and it bowed its head, letting her pat it. It cawed again and ruffled its feathers, tilting its head, looking at me. "Oh, really?" said Mavis to the raven. I clutched my book to my chest and hurried back into the hall. It was bloody cold and getting dark when I found Mavis, standing at a corner, squinting at a street sign. A bit of a row had erupted earlier, after she had cast a fire spell to brown her toast but ended up burning the kitchen blinds. Mavis had left without saying sorry, but she'd been gone for hours so Mum sent me to find her. "Mavis!" I shouted, and she jumped, looking this way and that before she saw me. I hurried across the street as the sound of a train whistle echoed in the distance. "Ah, it's you," she said, patting the pockets on her coat. "Out for a walk?" she asked, and it sounded like she was shivering. She wore only a light coat. I had a thick jacket on and even I was cold, my hands numb from the damp. "Come on, let's go home," I said, slipping my arm around hers. She sniffed. "No, I think I'm fine here." "Mavis, it's freezing! And Mum's not mad, let's just go!" She snatched her arm away. "You think I'm daft!" she cried. "It's not my fault! That spell's a sensitive one and, well... I must have—"
She huffed and began to walk the way I'd come. I chased after her and we continued in silence. We crossed over a large stone bridge that spanned the railway line. I ran my hands along the keystone, always amazed at how it held everything in place. We came to the park, the grass a deep jade colour in the evening light. It was empty but for us, and the ground squelched beneath our feet as we crossed over, passing by the kids' play area. "Ever come here?" asked Mavis, motioning to the equipment. "Well, yes. Like, ten years ago," I said, trying to snip the sarcasm out of my words. "Humph," she said then paused. "You don't think I'm a good witch?" "You think I'm some silly old woman. Well, my dear, let me assure you, I was the greatest witch in the lands." "Ugh, Mavis," I said, rolling my eyes. "Can we get home please? It's getting late." She raised her arms and began to speak, a strange spill of syllables that echoed and bounced. I felt the wind rising and my skin tingled. There was a hum in the air, like the moments before a thunderstorm, as she raised her arms. Leaves rushed up from the ground, spinning and whirling in rustling, interconnected threads. They shifted and spread, forming shapes like birds, but as if scrawled haphazardly, the shapes barely recognisable. The wind grew wilder and stronger and the swings began to move. A Coke can zipped through the air by my head. "Mavis!" I shouted, but she was leaning awkwardly, her hands trying to grab onto the slick swing set pole. Large sticks and branches were swirling now, and a strange groaning sound came from the sky. The light had been sucked away as dark clouds loomed downwards. Mavis was still chanting, and I ran to her. The wind shrieked, and the swings looped wildly, the chains rattling so hard I thought they would snap off. "Stop!" I screamed to the sky. Silence slammed into space and the leaves hung suspended above us. I stared at them open-mouthed then turned to Mavis. She seemed ready to say something. Then, with a loud sigh, the leaves fell to the ground. Mavis adjusted her coat and stomped across the park to our flats. Soon enough, it was time for my final exams and I hunkered down at home. I'd sleep in late and study all night, wandering around the still rooms in the quiet in between hours. I think part of it was a way to avoid Mum and Dad. We were arguing a lot now and trying to act normal the rest of the time. Mum kept saying that my future was my decision, but then five minutes later she would hassle me about needing to invest in a stable career and to build the right foundations. The constant bickering had worn me down. I popped my dinner into the microwave and stared at the calendar on the fridge. The exams were highlighted, but so was another date, in Mum's handwriting. They wanted me to go off and study engineering, a program that I thought I'd been interested in. Dad had even introduced me to some of the partners where he worked, and they'd organised for me to spend a week interning last summer. They were proud of their daughter being able to go to university. Mum had wanted to study accounting but wasn't able to, although she had done several bookkeeping evening courses. She kept telling me how a degree would open up a world of opportunities ... and yet ... I wasn't sure that I wanted to study engineering or if I even wanted to go to university at all. Most of my friends had their plans worked out for after school, whether that was university or taking a gap year or getting a job somewhere. The microwave beeped, and I took my plate to the kitchen table, rubbing my aching shoulders. I had several chapters to get through and I wasn't feeling too confident about my test the next day. She put her dinner in the microwave and pressed some buttons, then some more, then opened and shut it again. "Oh bother," she said. "What thing do you press again?" "Close it, then press nine, then zero, then the big start button." Several beeps followed – more than required – but at last the microwave started. "I can do the kettle!" Mavis said, proudly clicking the button. She pulled out a chair and sat opposite me, placing her hands on the table. I knew it was rude, but I couldn't help but stare at her fingers, which were all wobbly looking at the joints. "So, how goes the study?" she asked. "Tiring," I said. "I think my head is too full." "Humph," she said but with a smile. "A head's bigger than you think. I've been filling mine up for years! I'm still filling it, although everything's getting mixed up these days!" She laughed at that and I chuckled a little too. The microwave beeped, and she brought her food over. We ate together as the wind outside rattled against the glass. "When did you decide to study witchcraft?" I asked. Mavis slurped a strand of spaghetti with a smack. "Your great-grandfather wanted me to practice the magical arts," she said, "although I wasn't keen on it. Magic's fallen out of favour. Too wild and too unreliable. Science is so much more predictable." "So, you didn't want to go to Candlewish?" Mavis filled the teapot and brought two cups to the table. "Well, I did, and I didn't." "When you're young, a lot of what counts is finding your own way in the world. But it's also about finding out what you're good at and what you can do that's meaningful to the world." "I did my degree in the magical arts," she said. "But then I went and did my masters and Ph.D. in an area I was interested in. Biology. Do you know that I spent some years living in the South Pacific?" "It's beautiful there. I do miss it. It's been years... Decades." "Were you doing research there?" "Yes, studying tidal creatures. Fascinating little buggers. You ever wonder where life came from? Science is wonderful, but it doesn't explain everything." I sipped at my tea, trying to imagine Mavis on some tropical beach. "Here," she said, pushing the bowl of sugar cubes across the table. "Try something for me. Put one in my tea." I reached out to grab a cube. I hesitated and wondered if I should get back to my room to study. "I know a spark when I see one. Go on. Try it." "Just try. Don't overthink. See it. The words and the movements don't matter, not for a cantrip like this." Outside, flurries were blowing in the wind, piling up a thin layer of snow at the corners of the window. I took a deep breath. I closed my eyes then opened them again, wanting to keep my focus on the cubes. I imagined the outline of the one on top, picturing its rough edges and where it touched the cubes beneath it. I thought of how little it weighed ... barely anything at all. I hummed, something like a melody tickling my lips. Then I saw the cube twitch. I concentrated, imagining the sight of it floating. It wiggled then lifted, and I wondered if my singing was somehow pushing it. I sang some more as the cube drifted wobblily over the table. It reached Mavis' teacup and I stopped singing. It fell with a splash, little drops of tea soaking into the tablecloth. "Sloppy, but not bad for a first go," she said, taking a sip. I smiled, stretching my fingers out. A warm feeling flowed through me and excitement. "Was that a spell? I did it? Right?" "Indeed, you did," she said. "It feels good, doesn't it?" She was right. It did, a little like you'd feel after a good long walk. "You know, that's what I'm worried about most," she said, taking a sip from her cup. "Mmm, that's a good cup of tea." I opened my mouth, willing myself to think of something to say. Anything. A way to make her feel better. "Well," she said, pushing her chair so that it squealed on the floor. "I'm going to bed. And you—you had best resume your studies!" "So, you're just going to throw it all away now? All the hard work you've done?" Mum was yelling. Her voice trembled. "No, Mum!" I wailed, my heart pounding. We'd begun to row in the supermarket when she reminded me that we had to send the university applications in that week. I'd ummed and ahhed and wondered aloud about what else I might do. I'd said maybe I should get a pair of flip-flops because I might go work in a pub somewhere warm. The fight and bad vibes had trailed us all the way home and into the kitchen. "Don't you want to study engineering?" she said, placing cans into the cupboard heavily. "You were so passionate about it. There were so many opportunities, doing good things. Things you wanted to do!" "I know Mum," I said, passing her a bag of flour which she clutched away. "I'm not saying I don't want to do that!" "Well, Amelia, you know, it's disappointing to see you behaving so irresponsibly. The future isn't just something that works out! You have to see it! You have to have a goal!" She grabbed a box of eggs too quickly, cursing as we heard one crunch inside "You know, we've worked so hard to make these opportunities for you." "Mum! Ugh! I know that!" "Do you? You think your father's doing all those double shifts for fun? It's for you! For your tuition!" "Well, I'm not asking him to do it!" "One day, you might learn to appreciate when others do things for you." "And one day, you might listen to me for a change! Listen to what I want to do!" "And what would that be?" she yelled. "What do you want to do, Amelia?" "I don't know..." I shouted, but words were bubbling up. "Maybe... Maybe I want to go to Candlewish!" "Candlewish? What, to study magic?" "Mavis has shown me some spells, and I can do them, Mum. I can do them, and I haven't even had any training." My skin was burning, and my eyes throbbed. The light inside was too bright. "You think you'll have a future with magic? Pottering around some old castle for the rest of your life? I thought you wanted to amount to something!" I shrieked, and the room trembled, dislodging a bag of groceries off the table. Mum gaped at me and I knew I had to get out of there. I ran to my room, tears stinging my eyes. Mum was probably crying, too, but I couldn't go back. We'd just get right to fighting again. I flopped onto my bed and clenched my fists, willing the rushing sensation to go away. I had to distract myself, find something to clear my mind. On the floor, one of Aunt Mavis' books beckoned me. I leafed through it, looking over sentences scrawled in messy writing and pictures drawn by hand. There were spells of fire and lightning, and, as I read the words, I felt energy buzz in my fingertips. I pictured myself standing in the park, guiding leaves through the sky in great shapes and patterns, spinning around me until the world was hidden and gone. I shut the book and threw it across the room. I sat at my desk and began to study, forcing everything else to the back of my mind. I ploughed through practice exams, again and again, until my fingers were black with ink and my body ached from hand to neck. A noise woke me, and I opened my eyes. I'd fallen asleep on my notepad. It must have been Mum, heading out for work. My head was pounding, and my throat was parched, so I stepped out to go to the bathroom and get an aspirin. I saw that Mavis' door was open, and I heard a sound that stopped me. "Mavis?" I asked, peering in the doorway. She was sitting by the window, an open spell book in her lap. Her face was puffy and red, and her lip quivered. The wind rushed in, cold and fresh with the scent of earth and rain. "Even they don't," she said, gulping and sobbing. "They don't understand me anymore." She wailed, pointing out the window. In the morning light, I saw a group of ravens in flight in the spaces between the flats. They tilted their wings, riding the wind across to the tall trees in the park. I placed my hand on her shoulder and she leaned into it as the rain fell in great sheets. The daffodils came at last, and the dark clouds were swept away. Spring stumbled into summer and, before I knew it, the school term had ended. I found myself uncertain of what to do with so much free time. I enjoyed the warm days, feeling the sun on my skin. I was excited about a trip I'd booked with some friends, heading over to Spain to travel and explore. I'd planned it so that I'd be home by the end of August. "What a lovely day," said Mavis. We'd gone for an afternoon walk, a habit we'd begun when the clocks sprang forwards. She liked to wander around, although she no longer moved at her fast pace. Mum said that she would probably have to move to a special facility soon, but she was staying with us through the summer. "Yes, it's beautiful," I said. "Remember when we came here the first time, when you cast a certain spell?" She gave a wicked smile. "Oh, you should have seen your face. You were so mad at me." "You shouldn't have tried to kill me with leaves!" "Kill you? Pish posh, Lorencues Sirrocona isn't dangerous! Do you know I once used that spell to blow the prime minister's hat off his head? He'd come to visit Candlewish." She whispered. "No one ever found out it was me." I squeezed her arm and we walked to the flats. Kids were running around, shrieking with the delight of the first week of summer break. We got home and stepped inside. On the small table by the door was a thick, yellow envelope. I froze, my heart suddenly thumping hard. Mavis looked at the envelope then to me. She patted my hand and walked down the hall. Mum hovered by the doorway. I took a deep breath and opened it up, pulling a letter out. I looked at the crest at the top of the page then down to the words below. "Oh, wonderful!" said Mum. "Well done, darling." I bit my lip then spoke quickly, the words tumbling from my mouth. "It's a double degree, Mum. At Tyrthumbria," I said, my voice weak. Her smile seemed to freeze. "I changed my application," I said. "It's still an engineering degree, but I've also been accepted to Candlewish College." She licked her lips then smiled again. "Well, uh." "There's a scholarship, Mum, and it's both degrees. It's becoming a popular program, Mum. There are some special courses, like one on magic's increasing use in civil engineering projects." She cleared her throat and smiled. "Mum," I said, my heart thumping, "it's what I want." She looked away for a moment then gave a small sigh. "Amelia, darling, I'm ... a little worried about magic, and what it can ... do to you. But I... Well, I suppose you've shown me what you have in mind. And if this is really what you want to do, I—"
"I think there's something unique about doing both, Mum. And, yes, it is what I want to do." "Well!" she said, clasping her hands together. "Amelia, I am proud of you. I am, darling, although I can't quite picture you with a witch's hat." "Thanks Mum," I said then stepped forward and hugged her, even though she felt stiff. Then she patted my back, and I blinked away tears. There was so much to do. I'd be moving out soon! I'd need to find a dorm. There would be new friends, new things to learn! So many things I hadn't even begun to consider. Mum motioned to the living room and I smiled and stepped inside. Mavis was sitting by the window, watching the kids play in the courtyard below. She stared a moment then she gave a big smile. "Marvellous, my dear! To where have you been accepted?" "Tyrthumbria University. I'll be doing engineering ... and ... magic." She gave me a coy smile. "Passion and purpose. A good mix, I'd say!" "Maybe you could help me prepare. I mean I haven't had any magic training..."
"Gosh yes, you'll need to know some basics or you'll go off and do something silly like turn a classmate into a toad!" She flashed a cheeky smile. "Might as well start now!" she said. "Bring me my books. I'd better read the spells carefully!" I passed her a leather tome from the coffee table and she began flipping through the pages. "Ah! Yes, this has some lovely spells." She ran her fingers along the letters, whispering the words quietly. I looked over to Mum who stood by the kitchen door. She smiled at me. "I'll put the kettle on." 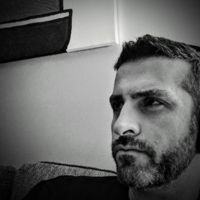 Paul Alex Gray enjoys writing linear and interactive fiction starring sentient black holes, wayward sea monsters, curious AIs and more. 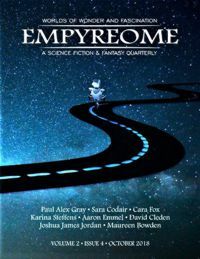 His work has been published in Nature Futures, Andromeda Spaceways, PodCastle and others. Paul grew up by the beaches of Australia, then traveled the world and now lives in Canada with his wife and two children. On his adventures, Paul has been a startup founder, game designer and mentor to technology entrepreneurs. Chat with him on Twitter @paulalexgray or visit www.paulalexgray.com.